When choosing a Classic or Muscle Car Restoration Shop, you want to work with a shop that is involved as deeply as possible in the world of Classic and Muscle Cars, and few are as entrenched in the business and are as passionnate about these cars and their owners as the V8 Speed & Resto Shop located in Red Bud, IL, just 40 minutes southeast of St. Louis, Missourri. 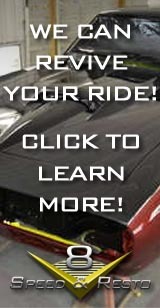 You also want to be sure you can stop in anytime and visit your car being restored, tour the facility, and meet the crew. 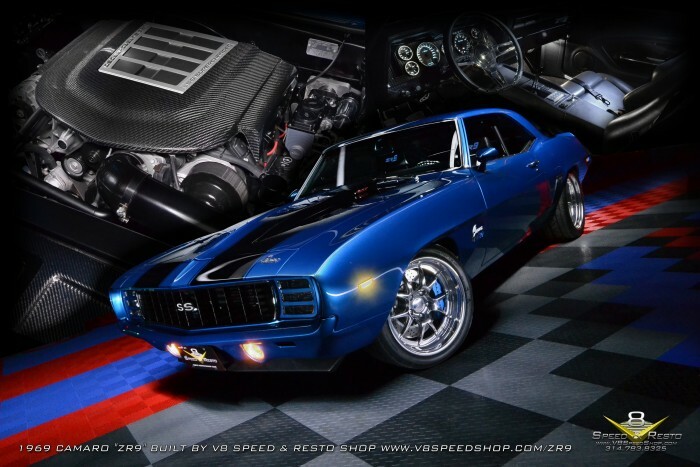 The V8 Speed & Resto Shop, is more than just a full-service classic car repair and restoration shop... V8 Speed & Resto is a multi-faceted conglomorate that builds cars, shares their stories on Television, and displays classic and Muscle Cars all over the country. The V8 Speed & Resto Shop is open weekdays from 8:00 AM to 5:00 PM Monday through Friday, And we will gladly make appointment to meet customers on weekend days or after hours should that be more convenient to discuss an antique or classic car restoration project. 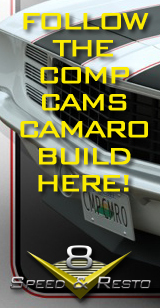 The V8 Speed & Resto shop offers many services in house including complete auto repainting, rust repair, sheet metal repair, high performance engine-building, high performance suspension upgrades, stock restorations, modified classic or muscle cars, general classic car repair, and more. Cars built in our shop has been featured in a variety of Enthusiast magazines and Publications, including Hot Rod Magazine, Popular Hot Rodding, Hemmings Muscle Machines, High Performance Pontiac, Chevy High Performance, Gearheads4Life, Car Craft Magazine, SEMA News, and many more. 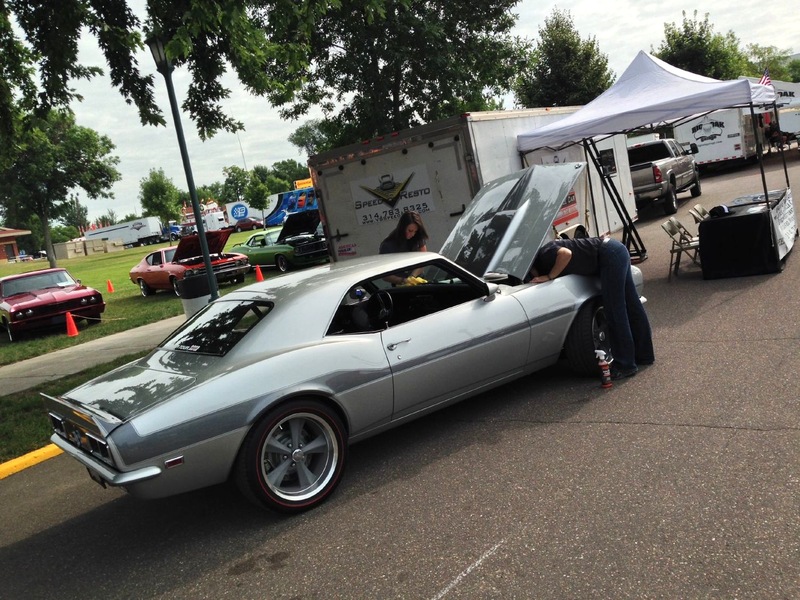 Our talented crew is often invited to participate in major national events like the SEMA trade show in Las Vegas, the Muscle Car and Corvette Nationals, the Street Machine Nationals, and we have participated in the Car Craft Pro Builders Shootout for three years in a row. Our shop is the car building arm of V8TV Productions Inc, a full-service television and video production company that produces the half-hour television show called V8TV airing on the TUFF TV and Rev’n networks all across the country, as well as Muscle Car Of The Week, the premiere muscle car show featuring unbelievable Muscle Cars from The Brothers Collection. We also produce the annual Drive-In Cruise, (http://www.driveincruise.com), a car show held at an the iconic Skyview Drive-In theater in Belleville, Illinois. Showing movies since 1949, the Skyview is the ideal location for the Drive-In Cruise where we host 3 - 400 Custom, Classic, & Muscle Cars and show a favorite car chase film on the BIG screen. The original Smokey and the Bandit was the first feature, and we'll be playing the classic Steve McQueen film Bullitt on August 25th for the 2016 event. Whether you plan on using your classic car or muscle car as a weekend cruiser, you would like to compete in shows, Your goal is to participate in cross-country trips like the Hot Rod Magazine Power Tour or Goodguys Cruise, or you enjoy drag racing or autocross racing events like the Optima Ultimate Street Car Challenge, our talented crew can bring your dream car to life for any purpose you choose. We use the finest automotive paint refinishing materials available Including Axalta paint, Evercoat fillers, 3M adhesives and abrasives, and others. Our sheet metal fabrication shop is fully stocked with high quality metal working tools from Mittler Brothers including sheet metal brakes, shears, flair punch tools, a variety of specialty tools like planishing hammers, english wheel, plasma cutters, HTP MIG, TIG, & resistance spot welders, and more. Weather you live in Red Bud, somewhere in the St. Louis, Missouri area, or in a country outside the USA, you can contact the V8 Speed & Resto shop today at 314-783-8325 or Click This Link to discuss your restoration for dream car project!